November 25, 1897 Supreme Authority and Sovereignty was retained by the Kingdom of Spain. 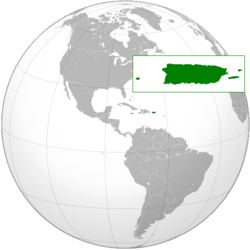 Puerto Rico, also known as the Commonwealth of Puerto Rico, is a U.S. territory in the Caribbean Sea. This means that it is part of the United States and citizens of Puerto Rico are de facto citizens of the United States as well. Puerto Rico is not a country. Because it is not a state, however, citizens cannot vote unless they have an address in one of the 50 official US states. It has almost 4 million (4,000,000) people. Its political system is based on a republican system. It has two official languages: Spanish and English. The currency (money) used is the United States dollar. Puerto Rico means "rich port" in Spanish. The Commonwealth of Puerto Rico includes the largest, main island and a number of smaller islands, including Mona, Vieques, and Culebra. Of those three smaller islands, only Culebra and Vieques are populated all year. Mona is unpopulated, but employees of the Puerto Rico Department of Natural Resources sometimes visit the island to inspect it and its wildlife. People can visit the island for hiking and camping by getting the permission needed. San Juan, on the northern side of the main island, is the island's largest city and the capital of the territory. The common languages are Spanish spoken by 94.7% of the population and English, spoken by 5.3%. Puerto Rico is one of the unincorporated territories of the USA. These are organised, self-governing territories with locally elected governors and legislatures. Puerto Rico elects a Resident Commissioner to the U.S. House of Representatives. The issue of the political status of the island (meaning whether it's a country, a U.S state, or a colony) is an issue of debate amongst the Puerto Rican people. In the past there have been many attempts to clearly define the island's political status by means of voting. Most of the time the majority of the people have chosen to remain a colony. However, in the last "status voting" the colonial option appeared to have lost well over 90% of its support, while the U.S state option has only gained strength in the last few decades. The Puerto Rican Independence party, on the other hand, has mainly lost a great deal of support within the last six decades. ↑ 4.0 4.1 "Government Development Bank of Puerto Rico, May 2011" (PDF). gdb-pur.com. Retrieved June 2, 2011. ↑ More exactly, it is an unincorporated territory. ↑ 7.0 7.1 "Puerto Rico files for biggest ever U.S. local government bankruptcy". Reuters. May 3, 2017. This page was last changed on 22 February 2019, at 14:30.